3 How to Take Casein? What is the best casein protein? Before we introduce you our rating of the best casein proteins we will tell what is it. Casein protein as you understand get from casein. 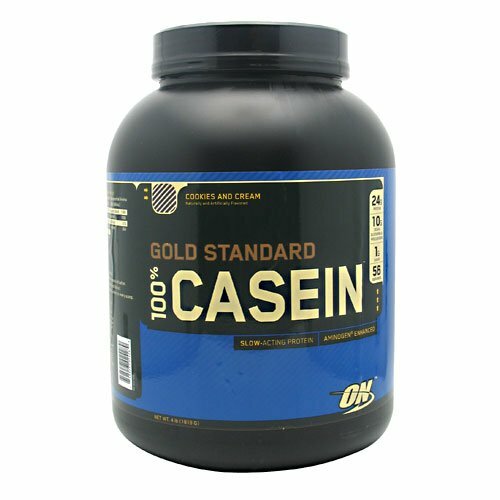 Casein is a complex protein that is derived from its predecessor — caseinogen. Milk makes up most of the Casein protein — 80 percent (the remaining 20 percent are whey protein). Therefore casein protein often called milk protein. Casein is found in all other products received from milk, the most famous of them — the curd. Casein is very popular sports nutrition supplement among fans of fitness and bodybuilding. The best way to drink casein protein is before going to bed. Sodium or Calcium caseinate is obtained by treatment of milk with various acids, with the use of any chemicals that put it mildly not too good. And Micellar casein is obtained by ultrafiltration of milk, roughly along the same lines as the whey protein obtained from the serum. If we look at the structure of these two types of casein, we will see that micellar protein is easier protein. Its assimilation occurs in the body better. Athletes who have used these two types of casein argue that the micellar better-perceived stomach and intestines. A study in which 17 persons took casein protein twice per day (before workout and immediately after it or within 5 hours after its completion) showed that after 10 days, the people who took casein could increase muscle mass twice more than those who did not take. Other research has shown that muscle growth is faster in people which consuming a mixture of casein protein together with whey protein than those who take only whey protein. Casein protein is digested and processed by the body two times slower than whey (for 7 hours). As muscle growth primarily occurs during sleep, casein protein is the best supplement, which can be taken before bedtime. For this, it was often called as «night protein». To achieve a more rapid effect, you can take casein combined with whey protein. Due to the fact that the casein is a slow-digesting protein, it is recommended not to take it immediately after workout. Casein is better to take before bedtime. Casein by Optimum Nutrition is one of the best casein protein for a quickly build up muscle mass and achieve a dense structure of muscle tissue. Gold standard 100% casein has 9 unique flavors: banana cream, chocolate cake batter, chocolate peanut butter, chocolate supreme, cookie dough, cookies cream, creamy vanilla, mint chocolate chip, strawberry. Also, Optimum Nutrition has casein with no artificial flavors, sweeteners or color: naturally flavored chocolate creamy, naturally flavored French vanilla, naturally flavored strawberry. Platinum 100% Casein by MuscleTech is one of the best casein protein on the market. 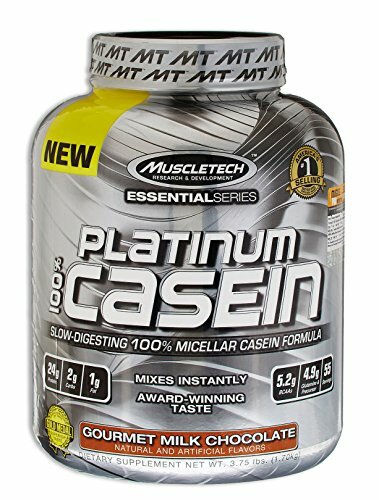 Platinum 100% Casein by MuscleTech is a quality supplement of a new generation, which has only clean and filtered casein. Protein supplement Platinum Casein based on micellar casein is designed for increasing muscle growth. It is suitable for athletes of all training levels which want to maintain muscle mass with normal metabolism. 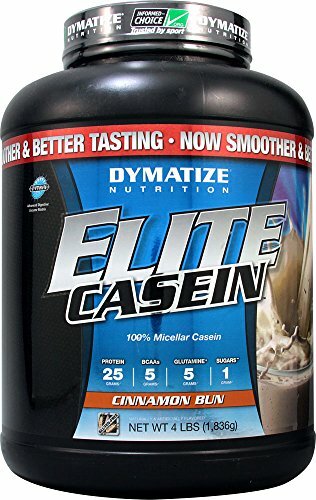 Elite Casein by Dymatize is a supplement with high-quality casein protein. Elite Casein is one of the best casein protein because each serving contains 24 grams of slowly digestible casein protein. It gives your muscles all that they need to build new muscle tissues. Elite Casein is produced exclusively from protein sources which have the maximum score in PDCAAS rating (It is a method of evaluating the protein quality). Foundation series 100% casein by Bodybuilding.com is a slow-digesting protein for ’round-the-clock muscle repair; liberation of amino acids which feed your hungry muscles between meals and before bed and it is 8-hour of muscle power. Platinum Tri-Celle Casein is an additional source of protein. It is sports nutrition product based on a new formula of micellar casein — the new generation of casein. Presented product is the result of a long-standing experience of experts the company Optimum Nutrition. They use the latest technologies in the industry production of food for athletes. 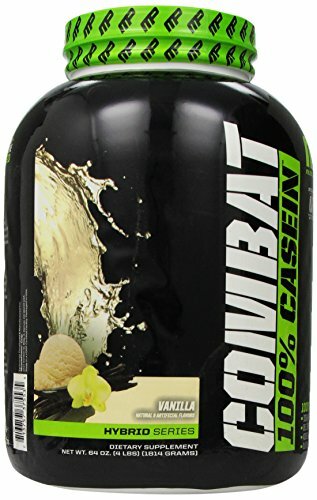 Combat 100% Casein by MusclePharm provides your muscles 28 grams of micellar casein. With Combat 100% Casein the MusclePharm company has reached a new level of production of the casein proteins. Train intensively — recover quicker with Combat 100% Casein! Ultra Peptide (Xtreme Formulations) is a premium source of micellar casein. It is one of the best casein protein which contains a complete set of amino acids and has a high biological value. Athletes of all body types can use this supplement including endomorphs because It does not lead to the formation and accumulation of body fat. The main actions are an anaboliс and anti-cataboliс. The supplement is indispensable for maintaining anabolism and resisting catabolism at night and in any other period of prolonged fasting. It can be used in conjunction with the whey protein and independently of it. Casein Protein is made by a recognized leader in the production of specialized sports nutrition — Six Star Pro Nutrition. It is a high-quality supplement and a reliable companion for a workout. Twenty grams of pure micellar casein in each serving will make your body muscular and strong in record time. Each serving the supplement includes 24 g pure micellar casein. It has powerful anti-catabolic properties and provides a continuous flow of amino acids to muscle fibers for long hours. The Casein Pro by the legendary company Universal Nutrition does not have a place for second-quality proteins.